The major item on the agenda of the Ninth Sobor meeting November 8-10, 1955 was the adoption of the Metropolia’s Statute. Every previous council since the First Sobor in 1907 had dealt with development of this document in some fashion. Various preliminary statutes and bylaws had been adopted at previous councils to enable the administrative structure and governance of the North American Church. 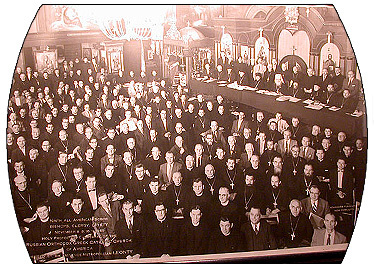 It was only at the 1955 Sobor that, after much heated debate, the North American Church was finally able to adopt a definitive and extensive Statute which clearly outlined the structure of her existence and incorporated the particularities of church life in North America while fully conforming to canon law and the Holy Tradition of the universal Orthodox Church. While amendments to the Statute made at subsequent councils helped the Church to fully digest the Statute and integrate it into church life at every level, the adoption of the Statute at the Ninth Sobor was in itself a remarkable accomplishment testifying to the increasing maturation of church life on this continent.